One often wonders how tolerant the River Yamuna is. While one rejoiced at the sight of the river swollen with monsoon waters, a spate of festivals served to negate the feeling. First there was Ganesh Chaturthi, then Durga Puja and now Chatth puja. While images of Ganesh and Durga were immersed in the river, considerably increasing the turbidity of the water, devotees performing the Chatth puja left the river banks littered with the remains. Little shrines are built and offerings of fruits, sweets and puja ingredients are made to them. Weeks after the puja, one can see the remnants lying around. While children and birds may pick up eatables and sugar cane, the non-degrading portions, including plastic bags, clay pots, diyas (earthen lamps) and chunni (cloth with zari and glitter work), are left around. 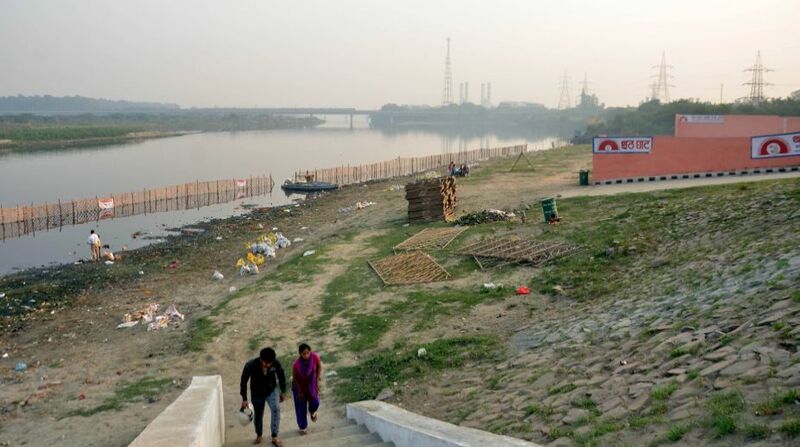 While the civic authorities rightfully claim to have cleaned up the river banks and waters before the immersion andpuja, what about the aftermath, one wonders. It’s a sad sight to see the debris floating in the river and the banks piled up with idols that did not disintegrate, cloth and accessories used to decorate the gods and the pandals, as well as tonnes of plastic bags. True, people need to be educated about the problem ~ in fact, there is an increased awareness and several measures have been taken to mitigate it. But some effort needs to be done by the civic authorities as well to clean up and ensure the river and its banks remain clean. Solutions are certainly not simple but not impossible. All it needs is a will and some amount of out-of-the-box thinking to resolve matters.